When I say Yo! Sushi, who thinks about chocolate? No-one. Fair enough. If chocolate is what you’re after, for once you’ve come to the wrong place. I really meant to take some chocolate along with me for some fusion food chocolate sushi, but rather stupidly I forgot. I can’t say as I was disappointed or that it was missed; I had a fabulous time and ate far more sushi than was good for me. A bunch of South West bloggers (glam fashion bloggers as well as the foodie crowd) met up early one evening last month at Yo! Sushi in Plymouth. Situated at the main entrance to Drake’s Circus, it’s hard to miss, but I’d never stopped there before. Our mission was to learn how to make sushi – obviously. We had our very own Sushi Master to guide us, the most marvellous Mazz. Our session was jam packed with plenty to eat along the way. We got to take a tray of sushi home with us too, along with the recipes, a bamboo rolling mat, a certificate and a few other bits and pieces. It’s a great activity to do with a bunch of friends, but it’s fine to go alone too. At £30 a person or £50 for two, I thought this was good value for money. Sushi has a rather special place in my life. It was the first meal CT ever made me and I was mighty impressed, both with the sushi that I’d never eaten before and with CT’s skill in preparing it. Like the rest of the British nation, I took to it with enthusiasm. I even had a go at making it myself once, but was singularly inept. So I was really looking forward to learning a few tips and tricks. The staff were particularly friendly and helpful and we were offered a drink as soon as we arrived. I opted for a mug of Japanese Green Tea that was no sooner finished before another one turned up in its place. It was quite delicious and just what was needed to keep us hydrated with all the hard work – oh wait a minute, did I say work? I meant fun. Mazz made it all look astonishingly easy, but he was a great teacher and had plenty of the looked for tips and tricks to pass on. 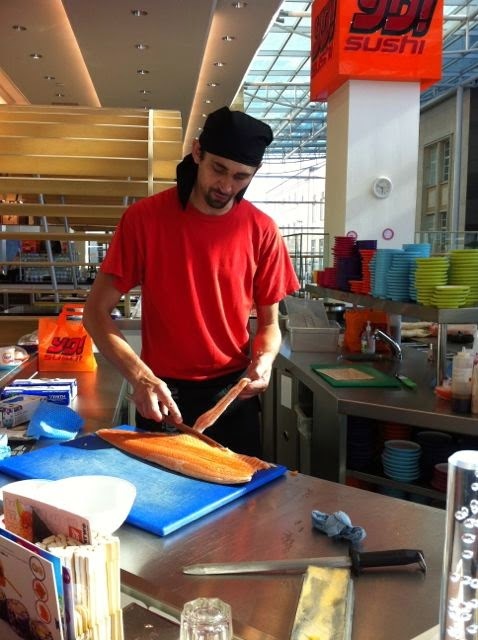 He started off with preparing a massive salmon thus proving he was a Master knife wielder as well as sushi maker. I tuned out at this point, but he went into a lot of detail and the others all seemed to get a lot out of it. Being a vegetarian was not a problem at all however; I was well catered for. Some of the sushi we were making was vegetarian anyway and when there was fish to be eaten, Mazz made me my own super delicious vegetarian versions with egg, avocado, tofu or all three. After an initial demo, we all had a go at making maki, which has a filling of cucumber and sesame seeds. We’d been taught well and all managed to produce some reasonably good looking sushi. Watching Mazz make mini ISO, or inside out sushi as it’s known, was quite something and the results were spectacular I thought. I’d not come across this technique before, but the rice is on the outside and the nori (seaweed) on the inside. With a filling of tofu, omelette and cucumber and a dusting of Japanese chilli powder on the outside, these were absolutely scrumptious. Hand rolls, ISOs, Gunkan and Nigiri all flew from Mazz’s hand and were subsequently demolished by us. My favourite was Futomaki which was a standard sushi roll with a filling of avocado, cucumber, omelette, radish pickle, carrots and mayonnaise. In truth, everything I tasted was delicious and it all looked stylish, neat and attractive, the way so many Japanese creations do. I took some of the fishy ones home in my bento box for CT who was very glad that I did. Cover the rolling mat with cling film to prevent sticking. Coat hands in a little oil to prevent sticking. Roll the sushi very tightly, so everything holds together. Use a sharp knife to cut the sushi and be firm when doing so. Many thanks to Jane of The Hedge Combers for organising the event, to Yo! Sushi for making it happen and to Mazz for his showmanship and good nature. Thanks. I know, it seems rather obvious when it’s pointed out, but I hadn’t thought about it either. I’ve always really had a problem enjoying sushi but even I have to admit those pictures look so amazing I’d be tempted. It’s the seaweed and I notice you have one without too much seaweed – well, covered by rice 🙂 Could be one to try next time I’m out and others are ordering sushi! Thanks Judith. There are some sushi that are really light on seaweed, so you might find something that will suit. i love sushi! Looks like you had a fab time! This looks and sounds like a wonderful class.Looks like you had lots of fun. fab! I’ve been invited to a few sushi making classes but I’ve never quite got there! Well worth going Fiona – well this one was anyway. Wow what a fun and skill filled evening. I’d love to be shown how to do it be a pro. I’ve tried making my own too, and although nice, they are not quite there. Your sushi looks amazing. It was really useful as well as a lot of fun, although I have to confess I haven’t tried it at home since the class. This looks like a really cool evening, never tried sushi before. You’re missing a treat Sophie. I tried sushi for the first time while in Australia some years ago. My d.i.l is Thai and makes the most delicious sushi. I’ve never been brave enough to try making it myself! I love that you posted this! My neighbor’s mother is first-generation from Japan and makes sushi for her family. Lisa (neighbor) has promised me that she and her mother will let me visit when they are making their next sushi meal! So excited! Oh brilliant Susan, sounds like you will be getting the real thing. What a fabulous experience for you. I’ve never tried making sushi myself, but I’ll have to try. Thanks for posting tips, too! After reading Barbara’s comment on her blog “Cornish Cream,” I linked to your blog which I am happy to find. I live in California, but still keep my parents’ house in Cornwall because I can’t bear to sever ties with Cornwall. In fact I just returned from there last Thursday so all is fresh in my mind. Blogs are a wonderful way to establish contacts, and I met Barbara and her husband for coffee at the Falmouth Hotel last September. I also follow “Around Perranuthnoe and the West of Cornwall” and enjoyed having giant meringues with Sue and her husband last September at the Peppercorn cafe in Perranuthnoe. I love sushi and have a favorite restaurant across the street which means we eat there a couple of times a month – I am a big fan of eel and avocado hand rolls. Good to hear from you Lynn. Cornwall is a rather special place – I lived away from it for many years and always missed it. Having said that, I have family in California who don’t seem to miss “home” at all. You’ve just drawn my attention to another Cornish blog I don’t know as well as a cafe I haven’t visited. I’ll take your sushi with avocado, but will omit the eel.